The thyroid gland regulates the body’s metabolism and when it doesn’t secrete enough hormones many women gain or have difficulties to lose weight. It happens quite often that even diet modifications, regular exercise and adjustment of the thyroid medication do not help. 1. You can still be hypothyroid and experience symptoms of hypothyroidism even while your thyroid blood tests are in the normal range. According to naturopathic physician Dr. Bryan Walsh many women have hypothyroid symptoms because they are not being accurately diagnosed. The following video on hypothyroidism is an excerpt from the Fat is not your fault program created by Dr. Walsh especially for people who are struggling with weight loss. He talks about thyroid defects that if undiagnosed can cause numerous hypothyroid symptoms including the inability to lose weight. 2. 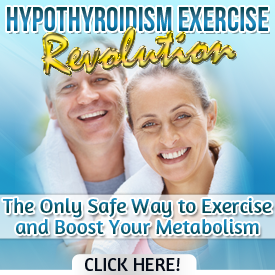 Hypothyroidism is only one of many contributing factors which could be responsible for a maximum 10% of the body weight gain mainly due to accumulation of salt and water. If you gain more weight it indicates that something else in your body in addition to your thyroid doesn’t work as it should. According to Dr. Bryan Walsh, our physiology dictates how well the body responds to diet and exercise. The influence of many other factors is very important in controlling the body weight. In the following article Dr. Walsh gives an overview about physiological factors that may negatively impact your weight loss efforts. Bold statement, but it’s true. If losing weight were simply about following a diet and exercise program, why are so many new books being written on the subject? Because they aren’t working and honestly, it’s time people learned the truth about fat loss. Let me first make one thing clear – diet and exercise are necessary for weight loss. Without them, weight loss won’t occur. But what happens when diet and exercise don’t work? Unfortunately this happens for far too many people. They follow a good diet and exercise program and they either don’t achieve all the weight loss they are hoping for, or they don’t lose any weight at all. It happens all the time. Weight loss is a complex and well-orchestrated metabolic, biochemical and hormonal event that requires a number of factors to be working properly for fat loss to occur. Hormones, blood sugar balance, gastrointestinal function, thyroid . . . if just one of these systems are not working properly, weight loss will not happen. A recent study showed that the presence of certain bacteria in your gut can actually increase the amount of calories you absorb. In other words if you are eating 1,500 calories a day, but you have too many of these bacteria in your gut, you could be absorbing 2,000 calories a day! Another recent study showed that food sensitivities were the cause of inflammation and obesity, and that the removal of food sensitivities is a treatment for obesity. Everyone in this study who eliminated foods they were sensitive to lost an average of 37 pounds in 12 weeks. Neurotransmitter imbalances (i.e. low dopamine) can lead to fatigue, sugar cravings and carbohydrate binges. In other words, if you have a hard time sticking to a diet – it might not be about will-power and motivation, but rather you might have a neurotransmitter imbalance. Many common pesticides and chemicals in our environment have been shown to increase fat gain in animal and human studies. The list goes on. There are many underlying reasons people are having a difficult time losing weight including thyroid issues, gastrointestinal dysfunction, adrenal stress, neurotransmitter imbalance, toxicity issues, hormonal imbalance and cellular dysfunction. These systems are the missing link in the weight loss industry that unfortunately no one is talking about. The point is, there are many more factors to weight loss than simply diet and exercise. We’re told by doctors that we need to lose weight to be healthy. And while that’s partly true, we also need to be healthy to lose weight. The healthier we are on the inside, the easier it is for us to lose weight on the outside. I cannot tell you how important understanding this concept is. If you’re a couch potato and wondering why you’re overweight, the first thing you need to do is follow a good diet and exercise program. But if you have been following a good program and aren’t seeing the results you’re after, it’s time to look closer as to why you are not losing weight. Dr. Bryan Walsh is a Naturopathic Physician specializing in helping people find the underlying reasons they aren’t losing weight. He has created a multi-media product called Fat Is Not Your Fault offering a manual, assessment form, audio interpretation guide and over 10 hours of video covering the many different reasons people aren’t losing weight.